President Donald Trump speaks during a press conference to discuss a revised U.S. trade agreement with Mexico and Canada in the Rose Garden of the White House, Washington, Oct. 1, 2018 (Photo by Oliver Contreras for Sipa USA via AP Images). 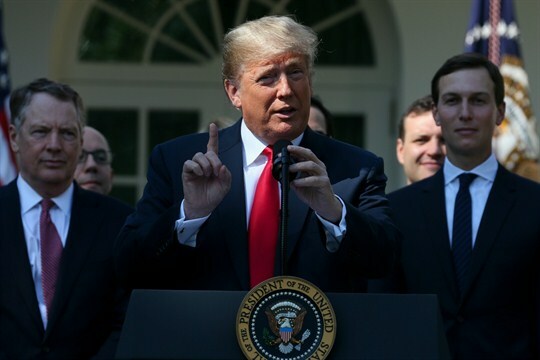 Besides getting Mexico to pay for the wall, which continues to elude him, there were two things that U.S. President Donald Trump seemed to want most out of the renegotiation of the North American Free Trade Agreement. One was increased access to the Canadian market for American dairy farmers, and the other was an incentive to increase car production in the United States. He won on those things, though the latter could well turn out to be a pyrrhic victory. But he is undercutting any credit he might get for those victories with his fondness for tariffs. Indeed, if looking tough for his political base continues to eclipse all else, the president could lose the chance to replace the NAFTA he hates with the one he says he loves, at least for now.